Sometimes it's really hard to tell if I'm doing right by my boys with this whole homeschooling thing. Heck, sometimes I'm not even sure I'm doing well with this whole parenting thing! We all have those days where we question what we are doing. Other days it seems like it's silly to have even spent a moment worrying because everything flows along so perfectly. Most days fall somewhere in the middle of those two extremes. 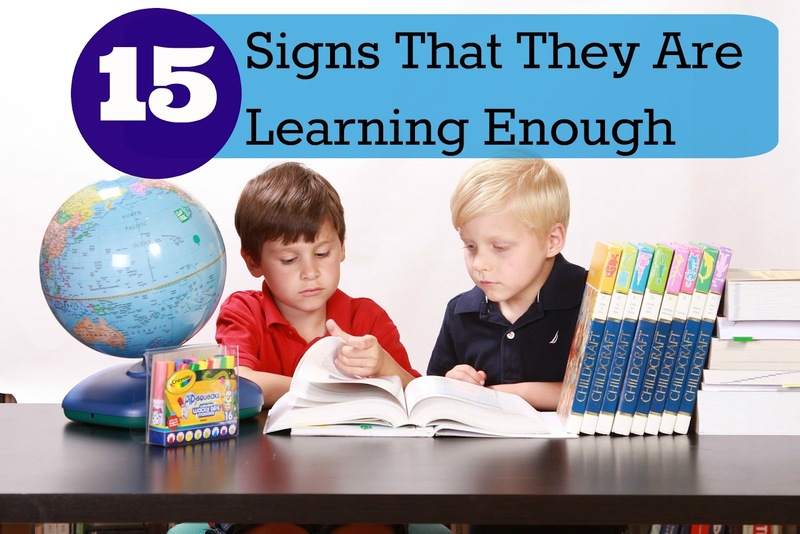 When we're homeschooling I find that I often can't keep doubt and fear from creeping in and I start to wonder if we're doing enough, if they're learning enough, and if we're on the right track. Lately, I've been lucky and I've been on a real roll of seeing evidence of the wonderful benefits of homeschooling. Seeing Evan curled up on his bed Saturday night after saying good night; reading when he could have been playing his video games (something we only allow on the weekend). Yeah, that was huge! Hearing about Ian doing a wonderful job writing (and spelling!) up a list for his grandfather at work. From what I heard he had a good sized list that was neatly written and wonderfully spelled. Watching the boys eagerly look through our binoculars and watching all the waterfowl that have started coming back to the pond. Watching Evan blow through the lists of sight words with his highlighter marker-- crossing off many words I can't even remember practicing with him. Hearing all three boys tell me that they'd rather I stay home and we all homeschool than having more "stuff" if I went back to work to earn a paycheck. "We don't need more stuff. It's just stuff. We have enough stuff and we'd rather be home with you learning together." OK so I may have paraphrased that a bit because I can't remember the exact words they used but that's what they were saying and yeah, that one melted my heart! Listening to all three boys playing nicely together for an hour (it's rare but it does sometimes happen). Hearing Alec and Evan beg for a sleepover with one another on a weekly basis. I guess brothers can be best friends! When one of the boys can tell me where something is located on a map (even when I'm still looking for it!). They have amazing geography skills! Watching the boys cook, cut and prepare food, wash their clothes, or clean the house. They have awesome housekeeping skills already and they're young enough that I still have plenty of time to continue working with them and teach them even more. Hearing them ASK to help or quietly doing laundry without my knowing is even better. Having complete strangers compliment me on my boys' behavior or helpfulness; people often kid with me that they'd like to borrow my kids to help them finish their grocery shopping and that I'm lucky to have such help. Most of the time they're right too. Watching my boys eagerly and excitingly writing their Harry Potter potion papers; boys who used to hate writing more than anything else in the world writing upwards of two pages about a made up potion. Hearing Ian reading me two or three pages each day from The Hunger Games books. He's reading so fluently and breezing through some pretty large vocabulary words (like equidistant). I don't often get to hear him read out loud since he hates it but WOW! I'm blown away by the progress he's made in these last few years of homeschooling. Watching my boys get excited over the books they found in their Easter basket and having Evan ask to read his new book to me. He begged me to let him read it to me before bed Easter night telling me he didn't want to wait until the next day to see what his book was all about! Watching all three of my boys catch on to new math concepts after just one short lesson or example. I always think they struggle with math concepts but really they just struggle with memorizing the basic facts; they understand the concepts and catch on quite easily to HOW it's done. Evan is now adding with carrying over and subtracting with regrouping. Alec can multiply two digit by two digit numbers. Ian, I'm not ashamed to say, can use a ruler & tape measure much more accurately than I can. Watching the boys willingly tackle new skills. Over the weekend Alec asked to help out with the grilling. 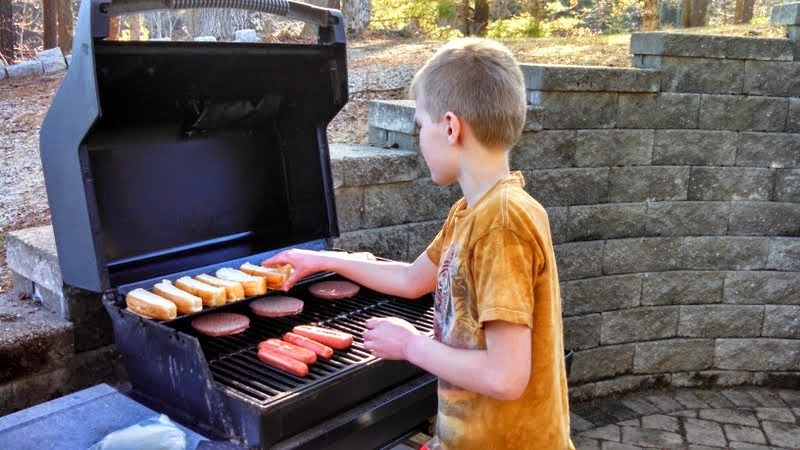 Over the course of the two days he learned to cook chicken, hot dogs and cheeseburgers on the grill. He's cautious and careful but not frightened and asked if he could cook something else on the grill tonight. And you're going to love it some day when they're all grown up and living independent lives, but come back together again as best buddies! Thanks so much for stopping by and taking the time to leave such kind comments!!! Anytime! I love seeing all your decorating ideas.